Here is my newest purchase, a 1849 Pocket that was made in 1868. It is in unusually good condition, at least NRA Fine condition. However, I think it has been cold blued in order to tone it up for the bluing to even out and become darker. What do you guys think? Can't say for sure by looking, but cold bluing has a very distinctive odor that lasts for decades. Use your nose. Also, it is fairly easy to polish off using a swatch of blue jeans material as a polishing rag. 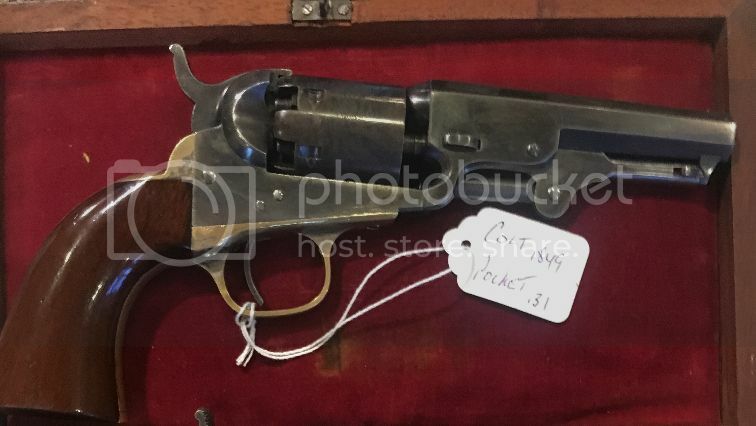 My long time old trusty antique firearms dealer tells me it is completely original. It was covered with a thin layer of grease. I removed the grease with mineral spirits and rubbed the piece with a towel for a short period of time. Then I smelled the gun to find no obnoxious odor. The dealer was surprised as to its unusually fine condition. That's really great news! That one is a keeper for sure. For future reference, if you know someone with a cold blued firearm, see what it smells like. It doesn't smell bad, it's just very distinctive. Just out of curiosity, since there are currently several cold-blue solutions/crèmes on the market, do they all smell the same, either wet or cured? Would they not become somewhat "inert" over time? What if the large part (barrel, frame, etc.) was cold -blued with several coats, then oiled with one of several gun oils (or motor oil, for that matter) for days/weeks and then coated with, say, Hoppe's #9? I would say that dog won't hunt. And, being an old fart, I know there have been many more previous brands from many years ago. Think Herter's of Waseca Minnesota for one. Just asking the Q's. Looking for the A's. Can't speak for all cold bluing products, but that's two for sure. I believe it's one of the main chemicals, can't say which one. I guess my olfactory senses aren't very good. I'll defer someone with a better nose.